Castleford Tigers captain Michael Shenton will be a proud man when he leads his home-town team out on the hallowed turf of Wembley on Saturday. 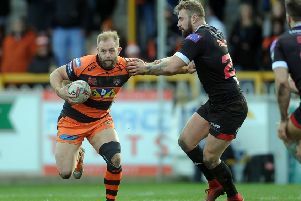 For Shenton it is a dream come true and fully vindicates his decision to return to Castleford after a spell with Super League big boys St Helens. The possibility of being the one to lift the famous trophy at the end should the Tigers win would be the undoubted highlight of his impressive career to date and he cannot wait for kick-off time to come around. “These are the kind of games I came back to Castleford to play,” Shenton told the Express. “Just to see the club at Wembley, it’s massive and it puts a smile on my face thinking back to when I made the decision to come back. “It’s a great moment in my career and for all the boys as well. It’s something that will never leave us to be part of this group of players. “I think it’s nothing less than we deserve. What we’ve done this year is pretty special and we’re just concentrating now on going one step better. “It will be a very proud moment in my career to lead the team out at Wembley, especially as a Castleford boy and a Castleford fan to start with. Also with such a great bunch of blokes – I couldn’t be happier to lead them out. “The way we’ve come together this year and stuck together in the tough times then some of the performances we’ve put in as a team it’s been incredible really. “The Widnes semi-final showed that. It’s never just one person that stands out for this team, everyone’s contributing. “It’s been an incredible journey to the final and we’ve had to focus. We’ve given the cup the respect it deserves and every one of our opponents the respect they deserve. Nothing will change this week. Shenton does not need to be told how important the cup is to the club and the whole town and is delighted with the support his team are getting from the people of Castleford. He said: “It’s great that the whole town is behind us. Hopefully the last one out of Castleford turns the lights off! “It makes it more special that the full town is supporting you. They are all talking about it. “The final means a lot to the fans as well as the club and the players that are in it. They’ve had some tough times. It’s massive. “It’s probably the biggest game of everyone at the club and the biggest for the club for 20 years. “We understand that, but also it’s all about enjoying it as well. We’ve not been there for a long time so we deserved to enjoy it. “As soon as we get close to the game our preparation will be spot on. It’s just about making sure we perform on the day. “At the moment it feels like the biggest game in my career. It probably is, but I don’t want to put too much pressure on myself, I just want to do well on the day, do my individual job for the team and also be a good leader. “It’s time for us now to switch things off on what’s going on externally. We need to concentrate on what we can control during the game. “It’s pretty much the same stuff we’ve been doing throughout the rounds of the Challenge Cup. I’m sure we’ll go well. “We’ve been good all year at sticking to game plans and playing the way we want to play, our own style of rugby. Shenton believes that winning the cup against a team as strong as Leeds Rhinos would make it all the more special. He added: “Leeds are going to be hard to beat. In recent history they are the best team in Super League, the most successful Leeds team of all time. “You expect to play the best team in the final and we’ve got that so it will make it more special if we do get the job done. “It’s a local derby being played out at Wembley and that adds a little bit of spice. “The first game we had with them this season they taught us a lesson in the second half. “We’d just come off the back of playing Huddersfield on the Sunday to a Thursday game, but in the second half we played some really dumb stuff. But we learned a lesson. “We can match the big sides now, but they can play for 80 minutes and that’s where we’ve got to get better and better.